There is no better soundtrack to backcountry exploration than the audible scream of a Hinckley-built triple, punctuated of course by the occasional reverberation from scraping footpegs. This beautiful cacophony allows me to focus so intently on the lines of my Triumph Tiger 800 XCx that time seems to be in a state of suspended animation, with nothing escaping my senses — not even the delicate purple lupines blooming at the apex of the turn. In 2011, Triumph launched headfirst into the mid-size adventure motorcycling segment with the debut of the completely new Tiger 800 XC. Centered on an amazingly potent DOHC 12-valve, inline-3, the new Tiger quickly gained in popularity despite its fairly average suspension and complete lack of sophisticated electronics for off-road travel. The new 2015 Triumph Tiger 800 XCx rectifies those shortcomings with advanced WP suspension and ride-by-wire electronics that position it technologically on level footing with its continental European counterparts. However, these welcome advancements still take a pillion position to the original driving force behind the Tiger’s popularity — its amazing powerplant. The 800 revs up effortlessly with a high-pitched whine and a rapid-fire exhaust note compliments of the 3-into-1 canister that provides an aural experience that is quintessentially Triumph. Throttle response is direct and fuel injection is precise — neither too lean nor too rich — from idle all the way to the 10,000 rpm redline. Snapping the throttle back and forth is addictive, yet a demonstrable way to showcase the counterbalanced engine as smooth and steady, without the usual vibration that becomes physically taxing on long-haul rides. ￼rev-counter is where the Tiger XCx prefers to prowl. The six-speed transmission meshes with the engine’s powerband without any noticeable gaps in spacing, while the cable-connected actuation of the clutch is smooth with a fairly light pull. The final drive is accomplished via a water- and-mud resistant O-ring chain wrapped around an oversized steel rear sprocket. The Tiger XCx’s chassis and handling are a superb compromise, as it is equipped with wire-spoke wheels and a tire/tube configuration that pairs a 21-inch front wheel with a 17-inch rear. This combination means greater flex and roll-over capacity while negotiating roots and rocks in off-road conditions, minimizing deflection, and increasing stability. On-road, the handling of the 21-incher manifests itself in a slightly slower turn-in while cornering, which is a welcome trade-off for increased confidence off-piste. The first generation Tiger 800s were remarkably easy to ride with linear power on demand, good handling and balance, and ergonomics that were all-day comfortable. The 2015 Tiger 800 XCx augments these characteristics with an advanced electronics package and a high-spec WP suspension designed to amplify both on- and off-road performance. Modulating acceleration and braking is a sophisticated ride-by-wire electronics package that combines anti-lock braking, traction control, and selectable throttle maps. ABS can be switched on and off, or set to Off-Road, which permits a limited amount of slip from the front wheel, and complete lock-up of the rear wheel for negotiating tight turns while trail riding. Likewise, traction control can be switched on and off, or set to Off-Road for balanced rear-wheel spin-ups, while keeping the chassis stable. Additionally, there are four throttle mappings that deliver full power, but alter the delivery to optimize for Rain, Road, Sport, and Off-Road conditions. To simplify it all, the XCx has two pre-configured modes for Road and Off-Road that combine optimal setting for ABS, TC, and throttle mapping, and one Rider mode that is customizable across the same parameters. Combining incredible power delivery, suspension actuation, and electronic modulation, the Triumph Tiger 800 XCx enables an extremely easy-to-ride-fast experience. The WP forks stay up in the stroke and are surprisingly progressive, even in aggressive on-road braking and cornering. Off-road, the WP suspension really shines with stable compliance over ruts, roots, and rocks. Twisty dirt roads beg for a handful of throttle and steering with the rear wheel. The Off-Road mode is optimized for dusty fun, but is still friendly enough for beginner sand novices to stretch their capabilities in a safe manner. Expert off-road riders will gravitate to the programmable Rider mode with the combination of Sport throttle mapping. Off-road ABS, and traction control switched off— the beauty of choice. 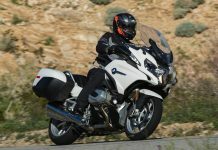 Braking is fully adequate in stopping the 487-pound Triumph Tiger 800 XCx (claimed wet), although the Bridgestone Battle Wing tires are a bit chirpy when engaging the ABS under hard braking on tarmac. Dual 308mm rotors up front are gripped with twin-pot Nissin calipers, with a single 255mm rotor and single-pot configuration in the rear. Brake lever feel is progressive and absent of any numbness when the ABS intervenes, making for a more seam- less interface between man and machine. Ergonomically, the Triumph Tiger 800 XCx is designed for comfort, with a wide, soft saddle that can be set to 33 or 34 inches from the ground. The handlebar position can be adjusted with optional risers, but I found that the standard handlebar position coupled with the seat in the low position was perfect for my 5′ 9″ frame, both standing and seated. The windscreen is small and not adjustable, but fully suitable for high-speed freeway conditions, and the handguards do double duty, keeping the hands warm in cold conditions and protected from brush while trail riding. One accoutrement that doesn’t go unappreciated is the full-featured cruise control, which gives me the ability to stretch out on the bike while riding, allowing me to ride through the entire five-gallon fuel tank without having to pull over for roadside calisthenics. Winding up a sinuous mountain road, the refinement in the Triumph Tiger 800 XCx is apparent as the complete package works harmoniously, encouraging me to lose myself in complete mental motorcycling immersion. Parking the Tiger atop the mountain, I perch myself on a stump and observe the lithe cat from a safe distance. Aesthetically, I’m completely satisfied. From behind, the taillight and rear subframe are sport bike cool. From the side, the tubular trellis frame has a dark titanium color powdercoat that strikes a strong balance with the black engine casings. Gazing from the front, the Triumph Tiger 800 XCx has the signature Triumph dual headlights fixed above the front fender beak that makes no secret in disclosing its appetite for adventure. From beginner rider to off-road ace, the 2015 Triumph Tiger 800 XCx democratizes the two-wheeled adventure riding experience with a platform that is both effortless and exhilarating, a rare find in the mid-size travel enduro segment. 2015 Triumph Tiger 800 XCx review from Ultimate MotorCycling magazine. For subscription services, click here.